The links between President Trump and Russia will prove to be deeper and darker than many Americans now believe. 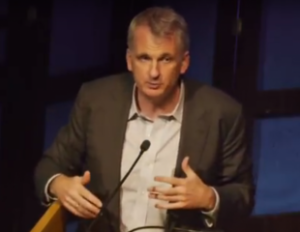 This is according to Timothy Snyder, a noted historian of the 20th century’s tyrannical regimes in Eastern Europe, who said the U.S. is now moving down a cultural and political path that has much in common with Russia under Vladimir Putin’s authoritarian and oligarchic rule. Snyder is author of the late-2016 pamphlet On Tyranny: Twenty Lessons From The Twentieth Century , which warned what a Trump presidency could bring and noted how widespread civic resistance could stop American authoritarianism. In his speech, he described how Trump was relying on Putin’s Russia as a model for where he was taking America. Some of this is already known, such as Trump’s campaign links to Russians and Americans working for Russian political allies and oligarchs. And some is not widely known, such as how Russia’s major way of interfering in the election was not hacking into voting machines or even stealing Democratic Party emails, but rather funneling propagandistic pro-Trump messaging via Facebook to sway voters in swing states. Overall, Snyder’s message is that the United States is not unique—neither in the world today nor against the backdrop of history—in being pushed in more authoritarian directions. If anything, Trump is exploiting the same tactics Putin and state-run media in Russia use, but with the American addiction to 24/7 media and smartphones and other devices, we’re making it easier for an emerging authoritarian like Trump to consolidate his power. “The question I want to ask here is, what have we gotten us into?” Snyder says, launching into the facts that have become known in the nearly six months since Trump and the GOP have taken office. Turning back to the 2016 election, he said Russia’s biggest impact wasn’t just stealing email from the Democratic National Committee and Hillary Clinton campaign. Trump urging the Russians to keep finding and releasing emails was an overlooked telltale sign. Snyder emphasized he was not alone in this conclusion. Then Snyder went through the Trump campaign’s senior staff who had personal connections to Russian allies, oligarchs and Putin. He started with Paul Manafort, who didn’t take a salary, but managed Trump’s campaign through the Republican National Convention. Snyder continued, saying Trump’s firing of FBI director James Comey—who was heading the investigation into his campaign ties to Russia—and his threats to fire Robert Mueller, who took over that investigation, were tantamount to confessions. Snyder’s inventory of Trump’s ties to people doing business in Russia and to wealthy or powerful Russians was in the service of a larger point. He believes that the same kind of authoritarian rule that now exists in Russia is where Trump is taking the country. The story that Americans tell themselves about being exceptions to history—all the shining city on a hill stuff—is clouding our ability to see that this is exactly what’s happening, he said. The reason we look at history, he added, is not just to familiarize ourselves with what’s possible, but to recognize dangerous trends and try to prevent them. What’s currently working against that is the country is getting used to Trump’s antics, his lies and deceptions, and his policies that are going to transfer more wealth from the man to the few. Snyder recounted the biggest lessons from his book on resisting tyranny. His second lesson is to support institutions—even if that means pressuring a Congress poised to do bad things (like taking healthcare away from tens of millions), because the American form of government needs to be pushed into exercising checks and balances. Similarly, professionals need to stand up for and assert professional standards as a counterpoint to unethical and unprofessional activities at the top of the government. “If lawyers and doctors and civil servants just hold steady, just hold onto some notion of what’s normal and good, then that can slow things down a lot,” he said. Third is not allowing oneself to be forced into hiding—as is already happening with many people in communities of color where family members don’t have legal visas. He said people need to organize in public and not buy into the myth of lone heroic actors. “In the American idea of freedom, it’s always that lone person against the overwhelming power of the government. And I am here to tell you in that situation in real life, the lone person always gets completely hammered. Or the lone person never actually makes that stand because when you’re a lone person you don’t make stands,” he said. Finally, he said that the truth—and fighting for fact-based thresholds for political debate and decisions—matters greatly. The descent into media ghettos and social media silos of like-minded people with shared but erroneous beliefs is what allows authoritarians to take power, he said, and that is another similarity between the U.S. and Russia under Putin. Snyder said such chaotic clashes between fake news and the truth have been persistent features of authoritarian regimes. Under Germany, there was the fantasy of the National Socialists representing “the people,” which wasn’t the same as all people. Communists had different fantasies about utopian futures that were cited to justify a catalog of power-grabbing abuses and maltreatment of citizenry. What worries him the most about Trump’s Russian connections are not his associates’ personal ties, per se, but how American society, culture and its political institutions are becoming Russia-like. Steven Rosenfeld covers national political issues for AlterNet, including America’s democracy and voting rights. He is the author of several books on elections and the co-author of Who Controls Our Schools: How Billionaire-Sponsored Privatization Is Destroying Democracy and the Charter School Industry  (AlterNet eBook, 2016). Carter said we were an oligarchy in 2015 and I tend to agree. Trump is one of many oligarchs, and the US Empire can’t stand to see Putin and Russia stand up to our funding of private mercenary jihadists in their efforts to destroy and partition Syria, just to secure energy transmission lines favored by our oligarchs (plus of course the inevitable arms dealers getting rich off our illegal wars). The US makes a mockery of international law and human decency on an unprecedented scale every single day. I’ve always enjoyed following your work, Carolyn, but our own oligarchs and political class are the ones who destroyed our democracy as we sat by silently watching television. And as far as the allegations from a US citizen about Russia pushing terror and chaos and authoritarian rule around the globe, all I can say is it’s best not to throw stones when you live in the biggest glass house known to history. Peace. You are absolutely correct that our own oligarchs are at fault, AND that does not mean that oligarchs from other countries should be sucked up to. The Trump gang of thugs is intent on collapsing the US government, and that’s obviously how collapse is proceeding. What is also true is that they are ushering in a genocidal fascism. This I will resist, no matter what faults lie at the feet of the US.